It seems the log home industry has created a perception that we are all about the “kit”. The Kit being a package of materials used to build your log home. To make it a little more coherent, the Kit may include packages for your log walls, rafters and beams, windows and doors and the conventional building materials to construct the “shell” of the house. The kit of materials is determined based on the architecture and specifications for your house. The “Shell” (also called a dry-in package) is the basic enclosed structural elements of the home (including exterior walls, the structural part of the roof system, windows and doors and the structural part of the floor). What is not included is the electrical system, plumbing, finished wall coverings, finished flooring, kitchen cabinets & appliances and in some cases the finished ceiling components. Today it is almost always about the whole Kit and Caboodle. If you are an Old English expert, you know that caboodle refers to the estate. Over time this expression has come to mean everything you need to accomplish your desired result. Our caboodle is all of the other items needed to complete your house ready to move in. 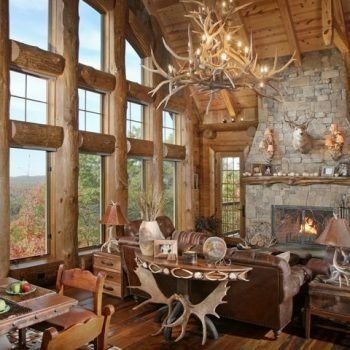 When you come to Modern Rustic Homes/Barna Log Homes for us to design and build your dream home, we provide the full range of design services, materials specifications and construction management to see that your project is complete. Many people refer to this as a “turnkey” job. You put the key in the door, turn the knob and move in. So if what you want is the comfort and assurance that you are getting a beautifully designed house, a high level of craftsmanship, a professionally managed project and fiscal accountability, then you want the whole kit and caboodle.